Without going into all the settings you have to choose from in the Elements Print and More Options dialog boxes, for now look at printing a photo and letting the printer manage color. Unless you want to print Picture Packages or Contact Sheets (Windows), use the Print dialog box from the Photo Editor. 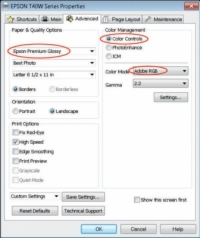 Color Management options offer you much better choices for managing color. 1With a photo open in the Photo Editor, choose File→Print or press Ctrl+P (Command+P on the Mac). The Print dialog box that opens contains all the settings you need to print a file. 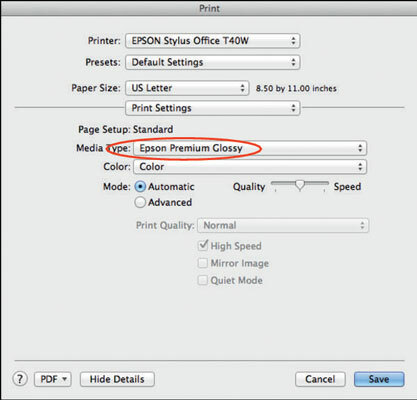 2Click Page Setup at the bottom of the Print dialog box and select the orientation of your print. Click OK. Your orientation choices are Portrait and Landscape. After you click OK, you return to the Print dialog box. 3In the upper right, choose your printer from the Select Printer drop-down list. Set the print attributes. Select the paper size, type of print, print size, and number of copies you want. 4In the lower left, click the More Options button, and, in the More Options dialog box that appears, click Color Management from the list on the left. 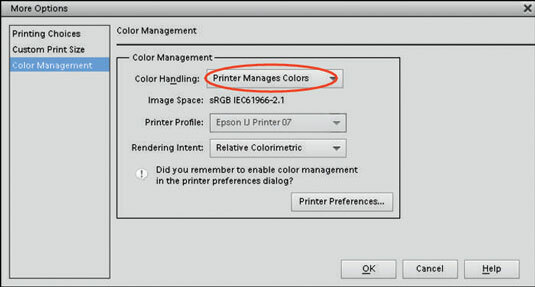 In the Color Management area, you choose how to manage color when you print files. 5From the Color Handling drop-down list, choose Printer Manages Colors. This choice uses your current workspace color — either sRGB or Adobe RGB (1998). 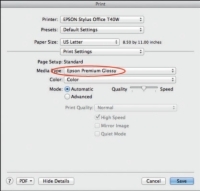 Moreover, this option tells your computer and printer to convert the color from your workspace to the printer output file when you open the Print dialog box. 6(Windows only) Set the printer preferences by clicking the Printer Preferences button in the More Options dialog box. The printing preferences dialog box for your printer driver opens. Skip the following steps for Mac users. 7(Mac only) Set the printer preferences by clicking OK in the More Options dialog box. You don’t have a Printer Preferences button in the More Options dialog box. The OS X Print dialog box opens. 9(Mac only) From the drop-down list below the Pages item in the Print dialog box, choose Print Settings. From the Media Type drop-down list, choose the paper for your output. 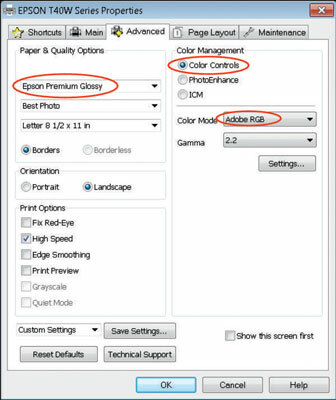 10(Mac only) To set color management, open the Print Settings drop-down list and choose Color Management. Make sure the default setting of Color Controls is selected. This setting is used when the printer manages color. Your Mac and your printer take it from here to print your image. Enjoy! 12(Windows only) Set print attributes from your printer’s dialog box. 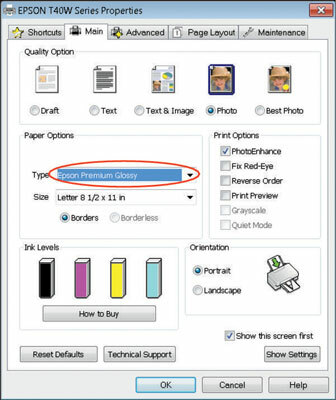 Select a paper type, such as Epson Premium Glossy (or another paper from the Type drop-down list that you may be using). Then click the Best Photo radio button. Now it’s time to color-manage your file. This step is critical in your print-production workflow. 13(Windows only) Click the Advanced tab. The Printing Preferences dialog box opens, displaying advanced settings. 14(Windows only) Make your choices in the advanced printing preferences dialog box. Select a paper type. 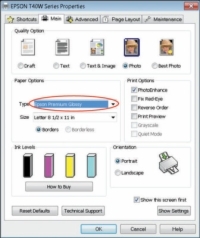 In this example, a letter-size photo was printed on Epson Premium Glossy paper, so those settings were chosen in the Paper & Quality Options section of the dialog box. Choose the same paper here as you did earlier. Turn on color management. 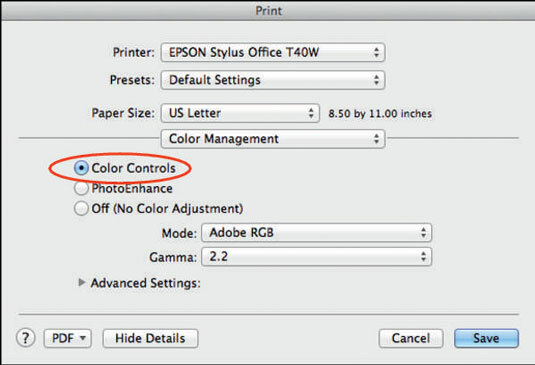 Because you’re letting the printer driver determine the color, you need to be certain that the Color Controls radio button is active. This setting tells the printer driver to automatically select a printer profile for the paper type you selected. Set the color mode. Don’t use Epson Vivid. This choice produces inferior results on photos. Choose Best Photo, the Epson Standard, or Adobe RGB, depending on your printer. If you frequently print files using the same settings, you can save your settings by clicking the Save Setting button. 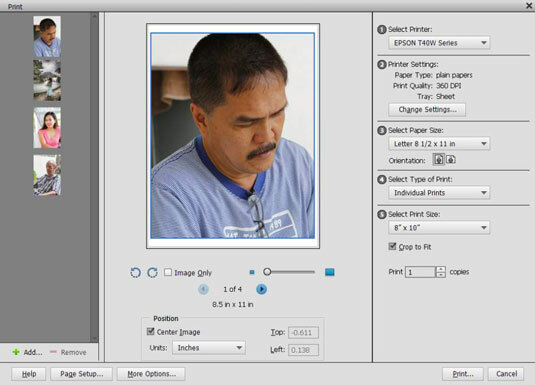 15(Windows only) To print the photo, click OK and then click OK again in the Print dialog box. Your file is sent to your printer. The color is converted automatically from your source workspace of sRGB or Adobe RGB (1998) to the profile that the printer driver automatically selects for you.